I hope that the ides of March is an auspicious date to finish 3D photo collage. I gave up on my cartouche outline frame idea and went with an arched solid background. After a half dozen coats of ebony stain, I finished it off with a gold wash. The photo doesn't do it justice. I'm happy to finally be able to sit back and enjoy my shrine to the Great American Eclipse. 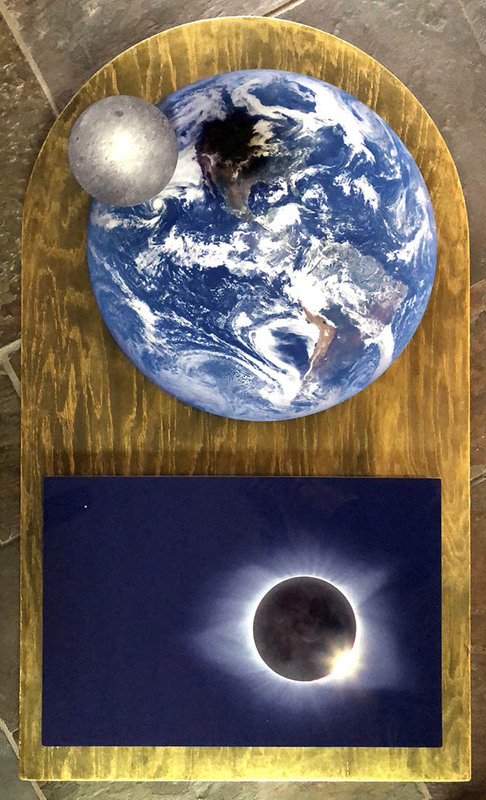 I used image data from the DSCOVR probe (lunar shadow on the earth, Deep Space Climate Observatory, Earth Polychrome Imaging Camera, credit NASA/EPIC Team), LRO satellite (far side of the Moon, Lunar Reconnaissance Orbiter, credit NASA/Goddard/Arizona State University), and my own images of the eclipse from the ground in Wyoming.